Mega Fortris cable lock seals offer many high security features, which make them a popular choice of seal within the transport industry. The lightweight nature of the cable lock seals offer the user high security featuring an aluminium body and wire steel cable. The body of the cable lock seals, is available in a variety of colours which offer high visibility. 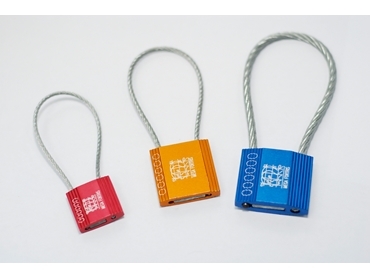 On each of the cable lock seals, a security serial number laser engraved, providing increased security. Cable lock seals from Mega Fortris are ideal for use in the transport industry due to their high visibility coloured bodies, being used in sectors such as the transport of chemicals, liquids, shipping containers, and high value goods.